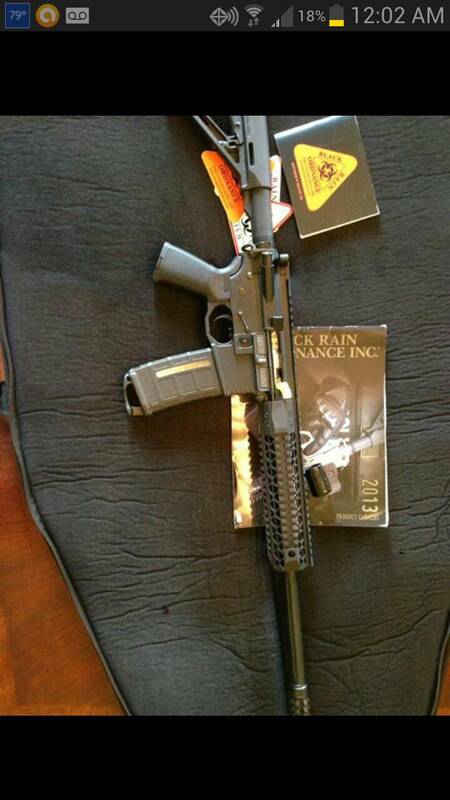 Thoughts on Black Rain Ordnance ? Whats yalls thoughts on these guns? Anyone have any experience with them? I've built two of them for friends. They are a Gucci AR. Nothing more or less than most others out there. They work about the same. Just look cooler with all the machine cuts. I will say, I'd prefer they did a "melt" on the sharp edges. They really are uncomfortable. I guess they thought the hard edges looked cooler, but they are somewhat painful. Especially the integral trigger guard. The edge on it chews the crap out if my middle finger. That feature alone would keep me from building my own. Here is a crappy phone pic of one I built for a buddy. Like I said, they look cool, but the sharp edges of the upper and lower receiver are a no-go for any close interaction with your firearm. Unless it's just ferrrr look'n at. Thanks for the info zee...a guy wants to trade me one brand new never been fired by him...it comes with the bro sling and soft case and p mag that the rifle came with......for my converted saiga ak47 variant plus 10 ak mags and 1500 or so rounds of 762....do you think im making out ok on this deal or should I not mess with it? Not gonna lie im only asking because im just not that familiar with the AR platform and especially not this build. I have been told these are quality AR's by a couple people. They are quality. But, having shot my fair share of AR/M4s...........it's nothing more than a pretty AR. It does the same thing as a DPMS. it boils down to what you want and what it's worth to you. You looking for Gucci or function? With the Black Rain, you are paying extra for the machining. Is that what you want? Deff function but I must say I wouldnt mind something that functions well and looks good....also was wondering how hard it is to change the handgaurd on them they look diff than others...this one has a 9" and I want to go with a longer one probably 12 or longer if possible. It depends on the handguard and how it attaches to the castle nut. Some have their own proprietary castle nut. Others, use a generic one. They function just fine. I just don't like the sharp edges. A small metal file could probably take the painful spots away. As Zed said, they look cool but if you were to hold one not knowing, you wouldn't see any extra ordinary noteworthy results. 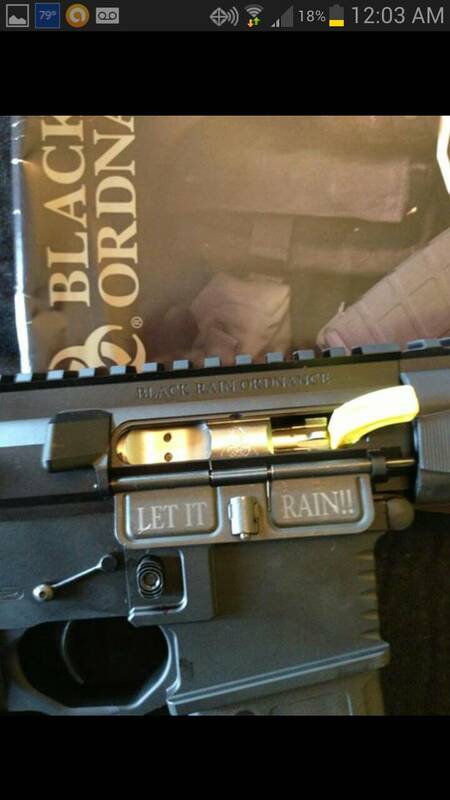 Not familiar with Black Rain; do they build rifles or just sell components? 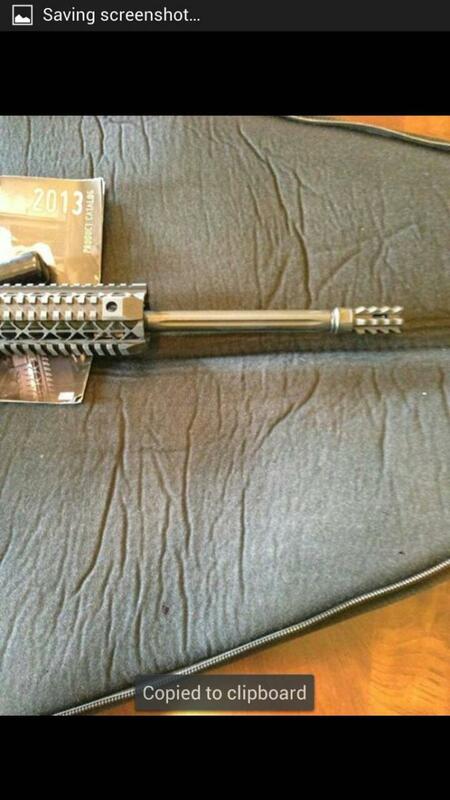 If the latter, find out what kind of barrel it has, and what brand of bolt carrier group. These are the heart and soul of an AR, and one can have a sweet lower and upper with garbage for guts. I had one. I thought the gun looked cool and being a Black Rain, it should shoot really well. PPPPHHHHHH!!!!!! Not worth the money to me. Sold mine and bought a Rock River that was MUCH more accurate than the Black Rain. They do build rifles...its a heavy barrel 1/8 twist they custom make their barrels...bolt is nickel boron the bcg is m16 nickel boron. It boils down to, do you want it more than what you're willing to trade. I do I believe but I also feel like I could trade for more bang if I be patient by more bang I mean a gun that cost less so more ammo and mags can be involved for me. I mean it sounds like a fair deal and I like the AR platform better than the AK, just depends on what you want. It does sound like you're throwing in a lot with the ammo and mags though. I picked up this rifle a while back which I believe is a Black Rain Ordnance gun but it has Dreadnaught Industries engraved on the receiver. The barrel is engraved Black Rain Ordnance and the receiver looks like theirs as well. What I can tell you is the rifle has been a sub-MOA shooter for me. My question is if I put the 15 inch handfaurd on will I still be able to see my break being that the rifle is a 16" carbine? Here she is bare bones will post more pics when shes done getting dressed up. 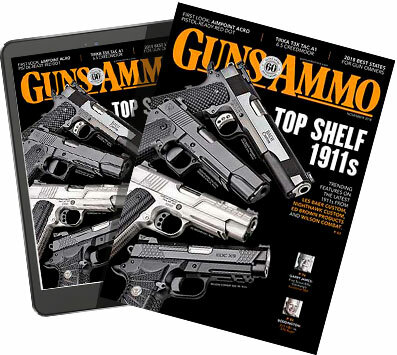 The 15" hand guard should come to the threaded part of the brake but the brake itself will be outside the hand guard. The one on mine is a 13"